Maybe it’s because I grew up just 30 minutes from where he lived, or maybe it’s because I’m a die-hard Yankees fan (please, hold your dislikes until the end). Whatever the reason, I cannot reminisce about my youth without the subject of Brien Taylor coming up for a topic. I’ve tried, but it never fails that he comes to mind more than most players who have actually played in the majors. 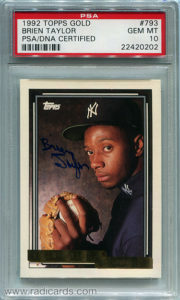 Brien is a former overall 1st-round draft pick in the 1991 MLB Draft, chosen by the Yankees, for a then-record amount of $1.55 million.1)Brien Taylor. www.baseball-reference.com In high school, Taylor had a record of 29-6 and an earned run average of 1.25. He also struck out 213 hitters in 88 innings pitched while walking 28. His fastball often hit 98 and 99 mph. Impressive stats, no? However, in December 1993, Brien was involved in a fight defending his brother, causing him to dislocate his shoulder. His pitching was never the same, and it led the Yankees to finally release him in 1998, where he was then signed by various MLB teams to pitch in the minors, eventually leading to his retirement in 2000. In 2005, he was arrested for child abuse, leaving his 4 kids, ages 2-11, alone for more than 8 hours. He claimed he thought they were with their mother, but he eventually missed his court date and even had some outstanding warrants against him. I was just getting started in collecting baseball cards in 1992, and knowing Taylor was “local” made it that much more personal for me. When the news came out regarding his fight and subsequent injury, it made me realize that you shouldn’t take things for granted because in a matter of minutes everything can be taken away from you, as it shows with Taylor. Who knows; he could’ve been the next Nolan Ryan and enjoyed a nice, long career. Maybe he would’ve been the next Kerry Wood; great for a moment, but overshadowed and plagued by injuries. We’ll never get to find out, but it’s fun to think about from time to time. It does hurt to know that he went from baseball’s next superstar to a convicted felon, but I don’t regret one moment of collecting his cards. I can remember when all of this went down in the early ’90’s. This kid had so much potential. It’s really a shame how it all transpired.